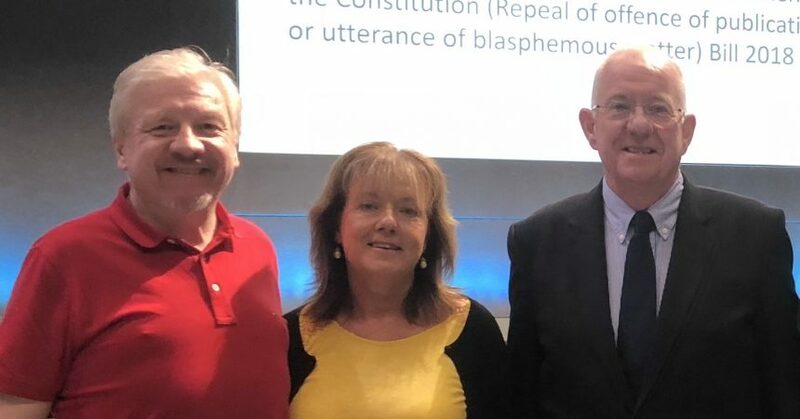 The Minister for Justice, Charlie Flanagan, has advised Atheist Ireland that the Bill designed to give legal effect to the outcome of last year’s blasphemy referendum has been forwarded from the Department of Justice to the Office of the Attorney General for formal Drafting. It is called the Repeal of Offence of Publication or Utterance of Blasphemous Matter Bill 2019. Atheist Ireland thanks Minister Flanagan for bringing the Referendum Bill to remove the offence from the Constitution, and now this Bill to remove the offence from our statute law. For the avoidance of doubt, it declares that the common law offence of blasphemy is abolished. It repeals Sections 36 and 37 of the Defamation Act 2009. It amends the Censorship of Films Act 1923, and the Censorship of Films (Amendment) Act 1925, to remove references to blasphemous matter. Atheist Ireland spent a decade lobbying for repeal of the blasphemy law with the Irish Government and Department of Justice, as well as at the United Nations, OSCE and the Council of Europe. We had three tours of public meetings around Ireland about the need to repeal the blasphemy law, in 2009, 2012, and 2018. When this Bill is passed, we will have finally removed the medieval crime of blasphemy from our constitution. States that execute people for blasphemy will no longer cite the Irish law at the United Nations, to justify their repression of religious minorities. Ireland was once a Catholic country. Today it is a pluralist country, which still has Catholic laws that we are gradually changing.